provincial and territorial governments. Read the full report and its recommendations. Given that median wait-times for transplantation is 4 years, in recent years patients and their families have resorted to public calls to find an organ donor. In Calgary, AB, A Calgary shop teacher who bought billboards across the province in search of a living kidney donor has finally found a match. Two researchers at the University of Alberta’s medical school have developed technology that helps lungs breathe outside the body to prolong their life in a bid to revolutionize organ donation worldwide. 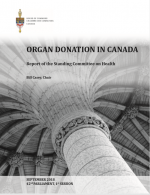 Neurologically determined deaths, or NDD, were the only way organs could be procured in Canada prior to 2006, when the DCD method was introduced in Ontario. The new method was adopted at the University of Alberta Hospital in Edmonton in 2009 but didn’t start happening in Calgary’s Foothills hospital until March 2016.